Peta-Gai (a.k.a. ‘PG’ – parental guidance is usually required) has a love of makeup so intense that in her late thirties, she embraced that love, left behind her highly successful career as a superannuation lawyer, and turned her passion, business acumen and leadership skills into a company where she now waves her magic (mascara) wand and enhances each client’s innate beauty, leaving them seeing themselves in a new and more confident, way. Peta-Gai is the Co-Founder, Visionary and Principal Makeup Artist of Iridis Cosmetics. Peta-Gai created and developed the unique Iridis Business Model; she is the leader and mentor of the Makeup Artists Educators; and is the strategic driving force behind the brand and Iridis experience. She is passionate about all things makeup, and the amazing power and confidence makeup can bring a woman. Peta-Gai has had an impressive list of clients, including celebrities, executives, commercial clients, National brands, National TV shows as well as everyday women (and men too). Peta-Gai has also been fortunate enough to assist a number of transgender women with their transition to their true selves, guiding their hair, makeup and styling, for which she has the perfect demeanour of support, discretion and kindness. She has been flown interstate and internationally for her hair and makeup services for campaigns, private clients and photo shoots. Peta-Gai is known for her exceptional understanding of how hair and makeup will translate on camera, and has built quite a reputation for makeup for photography and video, especially in the corporate and commercial space. Her hair and makeup work has been published in newspapers and countless magazines, (with a few covers in there as well!) including Australian Women’s Weekly Magazine, Women’s Health & Fitness Magazine (for which she was also an official contributor on makeup and beauty trends for their online and print magazines 2014), Australian Iron Man Magazine cover, featuring Laura Lydall and Marko Djordjic, Lita Magazine, the Herald Sun, the Financial Review Magazine, Little One Magazine, Ellements Magazine (subsidiary of Elle Magazine, from NYC), Kimi Magazine, Tenebrous, Surreal Beauty, Cynical Fashion, Wildheart, Dark Beauty, Xpressions and Dark Parlour Magazines. Peta-Gai has personally styled hair and applied makeup on over 1000 brides, and regularly has between five and thirty individual clients each week – she can translate any makeup look, work to any brief, and knows how to handle every skin type, ethnicity and age, as well as how to create every makeup look required. Her finely honed listening and communication skills ensure that the makeup and hair look is exactly what the client was desiring, every time. Lead Hair and Makeup Artist for the last two music videos for syntho-pop sensation, Asian Envy. Commercial Clients include: Swisse, hair and makeup for their Ambassadors, Spec Savers, Fernwood Fitness, Live Nation Touring Company, Cosmetic Surgery for Women, Dame Melba Opera Trust, McDonald’s Leadership Team, Orora Group for their Live Corporate Event held at the Forum Theatre, Taboo Intimacy, Tima Designs, various law firms for their annual photo shoot days,and multiple professional photographers and local designers such as Catherine Murphy. After building a 17 year career as a lawyer specialising in superannuation, Peta-Gai fully escaped the corporate world in September 2015. Since 2010, she’d been lawyering part time, while still working full time building the Iridis brand and business concept. Her official makeup career started in 1994, where her University job was at ‘The Body Shop’, and she was trained in makeup techniques by their celebrity Makeup Artist, Chase Aston. After graduating with Degrees in both Law and Arts (majoring in Sociology), Peta-Gai built a highly successful career in superannuation law and management, but in her spare time continued to create stunning looks for friends’ weddings and events, as well as making over friends and colleagues, teaching them how to do their own makeup. With the vision of Iridis firmly created in 2008, Peta-Gai returned to her studies, this time in makeup, and became a qualified Makeup Artist after years of being ‘self-taught’. The launch of Iridis has been a high point of success and happiness in an already impressive career. Also a qualified Trainer and Assessor, Peta-Gai utilises her teaching expertise to share her considerable knowledge about makeup and application in a personable, articulate, funny and clear way, which makes learning about makeup easy, accessible and engaging. Also an accomplished public speaker, Peta-Gai is often invited to present and share her story of ‘lawyer-turned-makeup artist entrepreneur’ (and related topics) at events. Peta-Gai has a real talent for making people feel amazing about themselves and to focus on their positive qualities,. Having Peta-Gai do your makeup for an event is always an uplifting experience, because she has the real knack of identifying the best feature on your face to make the focal point, enhance your natural beauty and have you believing you’re beautiful from start to finish. Her makeup work comprises a large component of building her client’s self esteem, which she also formally does as part of her work with Iridis, especially with teens. Peta-Gai used to be an amazing cook, but when she picked up makeup again full time, she realised that makeup was her creative outlet, not cooking (sorry Kelly). She also loves crafting, (embarrassingly) scrapbooking and journaling, reading and is a lover of all animals, but especially loves cats. If you’re also a cat lover, check out @the_makeup_cats over on Instagram – they’re the Iridis Mascots. (There’s a thesis topic in how most Makeup Artists are cat lovers, according to PG). Above all, Peta-Gai’s guiding path in life is to bring out the best in women – whether they’re her clients, her team, or those in her life. Find Peta-Gai and Iridis on Facebook and Instagram, Twitter, Pinterest, Google+, Linkedin, Snapchat or contact her through the Iridis Website. 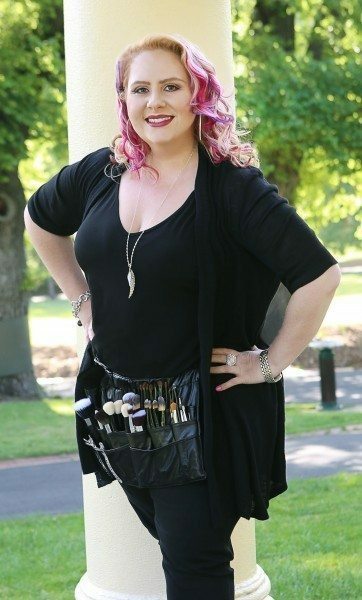 Peta-Gai is based in Yarraville, Victoria, but travels Nationally and Internationally for hair and makeup services, speaking engagements and to spread the message of self-love, self-acceptance and utter gorgeousness.